Tucked away on a charming nook, just behind the Gothic Cathedral La Seu, Bun Bo Vietnam is a great place to escape the tourist maelstrom and settle down for some tasty Asian cuisine, along with a cocktail or two (try the saikirinha!). The restaurant’s eponymous dish, the bún bò, is a great choice at any time, but particularly on a warm day as the vermicelli noodles are served at room temperature along with beef, fresh cucumber, mint and coriander. Inside Bun Bo you’ll find genuine Vietnamese treasures shipped over to Barcelona from Saigon’s famous Ben Thanh Market, such as the shiny metallic ‘cyclo’ (rickshaw) and silk Chinese lanterns hanging from the ceiling. Outside there’s a delightful terrace for enjoying a Cobra or Asahi beer, or an expresso coffee in the Vietnamese style. 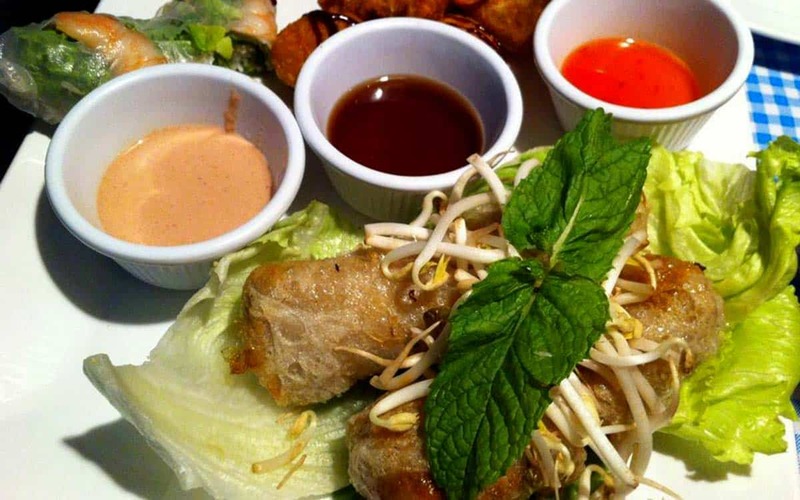 Bun Bo Vietnam is open from 1pm to 1am every day (no siesta here!) and until 5pm you can also take advantage of their lunch menu where three courses and a drink costs around 10 euros. Discover more great places to eat here.